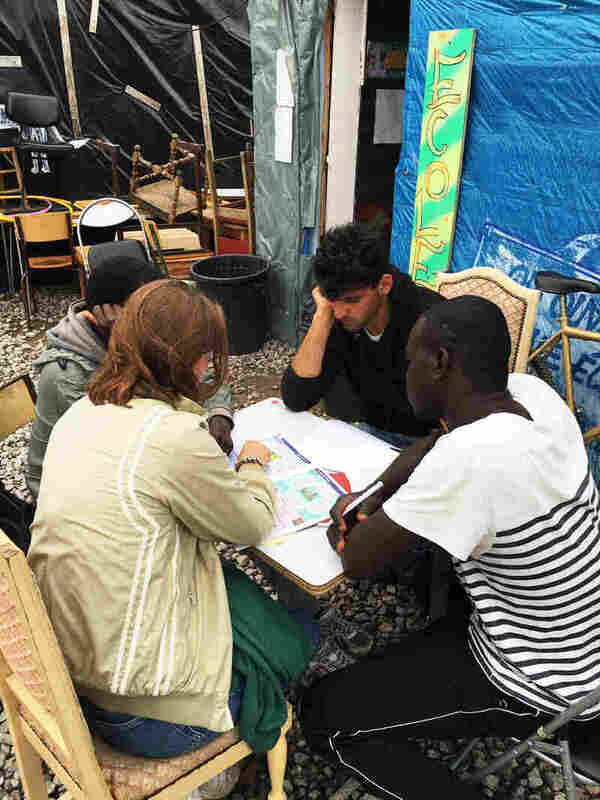 For One French Woman, An Eye-Opening Visit To Calais' Refugee 'Jungle' : Parallels The camp has grown to 9,000 people. Calais residents oppose it and want it shut down for good. But when one protester goes there for the first time, she is moved and surprised by what she sees. Migrants walk past makeshift shops and shelters at a camp known as "The Jungle" in Calais, France, on Sept. 6. Overcrowding has become an issue in the camp. "I imagined a little camp," says Calais resident Nicole Cordier, who has protested against The Jungle. "Not an immense camp like this one. This is a city." Nicole Cordier, 68, is walking through the middle of a four-lane highway outside the northern French port city of Calais. She's there with a few hundred other townspeople, truckers and farmers, to protest a makeshift refugee camp that keeps growing just outside their city. The highway is empty of traffic on this day, as it is blocked by trucks and giant tractors. Farmers say the refugees trample their crops and hide in their fields. Truck drivers and port workers say the migrants are becoming increasingly aggressive as they try to jump aboard and stow away in containers going through the Channel Tunnel to Britain. Many have relatives or friends in the U.K., and rumors persist that asylum chances and job opportunities are better than in France. Wearing an "I Heart Calais" T-shirt, Nicole Cordier visits a part of The Jungle where children can play. Some at the camp ask how she got a small cut on her knee. "No one in Calais ever asked me about that," she says. 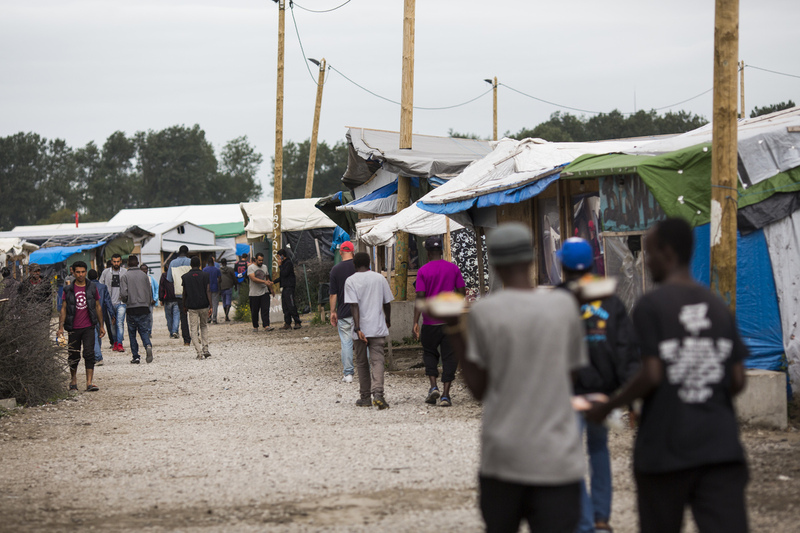 Calais residents say the camp is hurting their economy. British tourists who used to stop and shop in Calais now bypass the city, Cordier says. "And my friends in Paris have this vision that the city is being invaded by immigrants." Even though Cordier is protesting the camp, she has never actually been there. She asks if she can come along with me to what's become known as "The Jungle." A few minutes later, we get out of the car in another world. Three bare-chested men are washing at an outdoor spigot. There are pup tents and lean-tos made of sticks draped with tarps. Cordier is jolted by what she sees. "This is upsetting," she says. "We have a life, a roof over our heads, a TV. We get up in the morning and have breakfast. It must be different for them. Where do you sleep?" she asks a young man. He doesn't speak French, but a volunteer responds that many sleep in tents. Cordier, who spent her life working as a nursing assistant, seems especially taken with and worried about the children here. She coos at one little girl being held in the arms of a volunteer. She wants to know all of the children's ages and then asks if there's anything they need that she can bring. Cordier says she never imagined The Jungle would be like this. "I imagined a little camp," she says. "Not an immense camp like this one. This is a city." We meet up with Alexandra Simmons, who works with Care4Calais, a humanitarian organization devoted to improving life in the camp. Simmons says the French government's partial demolition of The Jungle in February did not stop newcomers from coming. She says the camp now is bigger than ever, with more than 9,000 people and hundreds more arriving every day. "It's a challenge to try and keep up with the pace that the camp is growing," she says. "To be able to provide the aid needed for the people here in food and clothing and cooking gas. And firewood to keep warm for the winter is a really big challenge that we're currently facing." The British government is planning to pay for a wall that will be built along the highway to keep refugees off the road and away from trucks. The French government says it will gradually shut the camp down for good in the coming months and place inhabitants in official refugee camps around the country. But Simmons says the problem in Calais is linked to the larger European refugee crisis and cannot be solved simply by closing the camp. A volunteer at The Jungle gives migrants an English lesson there. 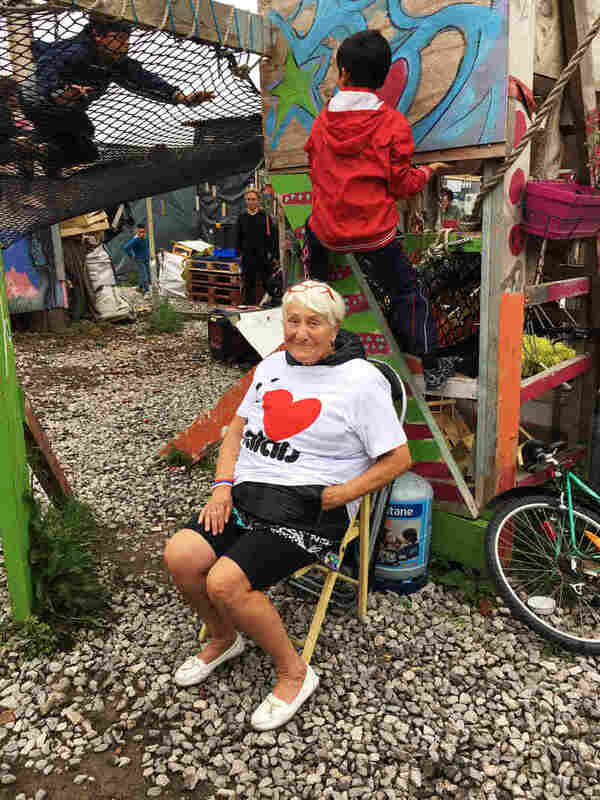 "If you demolish the camp here," she says, "what will happen is you'll have a large percentage of this population dispersed, so you'll end up with a load of temporary camps across the north coast of France. The conditions here are horrendous enough, but if you start dismantling the camp, then you are worsening the situation. The women, the children, they're the ones who are going to suffer the most if this place gets torn down." In February, Simmons says, 129 children went missing after the demolitions. There are about 800 kids in The Jungle, and half are unaccompanied minors, Simmons says. Those unaccompanied minors include more than 100 children with confirmed family members in Britain. But Simmons says they are still unable to join those relatives. She says the British and French governments are taking months to process asylum claims, and people have no option but to look for illegal ways to survive — squatting illegally in this camp or trying to ride on trucks into Britain. As we make our way through the camp, Cordier is surprised by the refugees' resourcefulness. People are cooking and washing clothes. There are little shops. Despite the tough conditions, people are friendly. Some ask her how she got a small cut on her knee. "No one in Calais ever asked me about that," she says. We're invited into a small hut for tea. Cordier leaves her muddy shoes at the door. Inside, we get a glimpse of the other side of the story told by some of the French truckers. Abdel, a 20-year-old from Afghanistan who fears giving his last name, says the truckers try to run over refugees. Police are abusive and find any excuse to beat them. "Sometimes they accuse us of walking on somebody's farm, when we're clearly walking on the road and nowhere near a farm," he says. "They treat us like animals," he continues. "We are human. They should treat us like humans. Imagine instead of me, it was your son who was here. How would you feel? What could you do? These people are someone's son. They're someone's brother." Abdel says he was a law student before he left Afghanistan. He says one day American soldiers arrived in his peaceful village. Locals begged the soldiers to leave before they made problems. But the soldiers refused, and his village was eventually destroyed in a firefight with the Taliban. "They put the war in our countries, that's why we are here," Abdel says. "They made us leave our countries and we did! And now they're just changing their mind. It's just a big game." At that moment, almost as if on cue, a young man with his head in a big bandage sits down to join us. Cordier looks alarmed and asks what happened. As it turns out, he had been shot by police with a rubber bullet. The youth shows us a picture on his cellphone of his shaved head and stitches. Cordier becomes angry. "This is shameful, so shameful," she says. She says every resident of Calais should visit The Jungle and see things for themselves. As we leave, Cordier gives Simmons her phone number. She says she wants to come back to The Jungle as a volunteer to help.